Snow-covered mountains are one of the most beautiful sights in nature, but in the wrong circumstances they can kill you. Skiers and other mountain enthusiasts sometimes refer to avalanches as the “white death”, and for good reason. Hundreds die in avalanches every year, and a great deal of effort is spent on trying to understand the factors that cause avalanches in the hope of decreasing this toll. Located in the Alps and a mecca for winter sports, Switzerland takes avalanches seriously. The Swiss Institute for Snow and Avalanche Research (SLF) monitors snow conditions, issues warnings, and collects data on avalanches. Their web site is very interesting for those interested in winter sports in the Alps. I find the snow maps particularly useful. But for this post I will use their data on fatal Swiss avalanches in the last 20 years to experiment with different ways to visualize some patterns and relationships. The dataset includes information on the date, location, elevation, and number of fatalities, in addition to the slope aspect, type of activity involved (e.g. off-piste skiing), and danger level at the time of the avalanche. 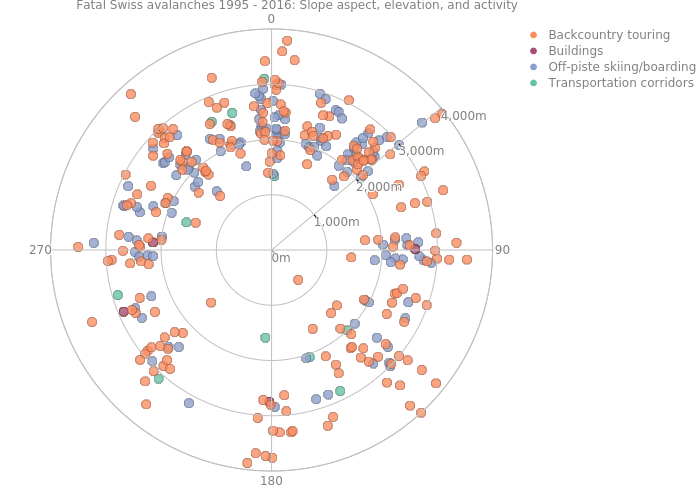 Over the last 20 years there have been 361 fatal avalanches in Switzerland, for a total of 465 deaths. Most avalanches killed only one victim. The gaps at NNE and NNW are probably artifacts of how the aspect data was reported. A few interesting insights emerge from this plot. First, February is clearly the most deadly month for avalanches. In December there are actually quite a few avalanches on SE facing slopes, but by January the predominate direction is centered around NW. In February, and to some extent in March, it changes to N-NE. In April it’s NW again, but by then there are significantly few avalanches. So there are some monthly patterns, but I’m not exactly sure what the explanation is. Of course to really nail this down we’d want to do some statistics as well. One pattern I expected, but did not see, was a decrease in the dominance of northern aspects later in the spring. I expected this because as the days get longer, the shading effect of north facing slopes decreases. It’s important to remember that these are fatal avalanches, and a dataset of all avalanches would look different. For example there are probably a lot of wet avalanches on southern slopes in the spring. But these are much less dangerous than the slab and dry powder avalanches, and therefore not reflected in the fatality data. This plot is similar to the previous ones in that the angular axis represent compass direction (e.g. 90 degrees means an east-facing slope). The radial axis (the distance form the center) represent the elevation where the avalanche occurred. And color represents the type of activity that resulted in the fatality or fatalities. Each point is one avalanche. The data are jittered (random variations in aspect) to minimize overplotting. This is necessary because the aspect data are recorded by compass direction (e.g. NE or ESE). The density of the points clearly illustrates the dominance of north-facing aspects. It’s also clear that most avalanches occur between 2000 and 3000 meters (in fact the mean is 2507 m). In terms of activity, backcountry touring and off-piste skiing and boarding dominate. And avalanches at very high altitudes are mostly associated with backcountry touring, which makes sense, as not many lifts go up above 3000m. Perhaps especially perceptive viewer can make out some other patterns in the relationships between variables, but I can’t. Any thoughts on the usefulness of this plot for the dataset? Interestingly, the great majority of deaths happened when warning levels where moderate or considerable. There were significantly fewer deaths during high or very high warning periods. One reason must be that high/very high warnings don’t occur that frequently, but it’s also likely that skiers and mountaineers exercise greater caution or even stay off the mountain during these exceptionally dangerous times. There’s probably some risk compensation going on here. To really quantify risk, you have to know more than just the number of deaths at a given time or place. You also have to know how many people engaged in activities in avalanche country without dying. One clever approach is to use social media to estimate activity levels, as demonstrated in this paper. Have fun in the mountains and stay safe! Data and code from this post available here. Has Your Country Ratified the Minamata Convention on Mercury? This map shows the current status of ratifications of the Minamata Convention on Mercury. Although I update it frequently, check mercuryconvention.org for the most recent status. The map also shows countries engaged in Minamata initial assessment (MIA) and artisanal and small-scale gold mining national action plan (NAP) projects funded by the Global Environment Facility (GEF), along with the implementing agencies. Use the “Visible layers” function on the map to toggle between ratification status, MIAs, and NAPs. The full screen button, located below the zoom controls, is also useful. Data on ratification and GEF project status from the Interim Secretariat of the Minamata Convention and UNEP. Country boundaries from Natural Earth. Mapping done in CartoDB using Robinson projection.